In its continuous effort for promoting and developing padel in Belgium, EuroPadel has created a padel academy, EuroPadel Academy, with the aim of provide a full range of services in order to fulfil the expectations of all its members. To provide full training at all different levels, from beginner to advanced and competition players. To organise the training for teams competing in the next coming interclub competitions (expecting to star early in 2017). To organise the different tournaments: europadel tournaments and official Belgium federated tournaments (VLA and AFP). 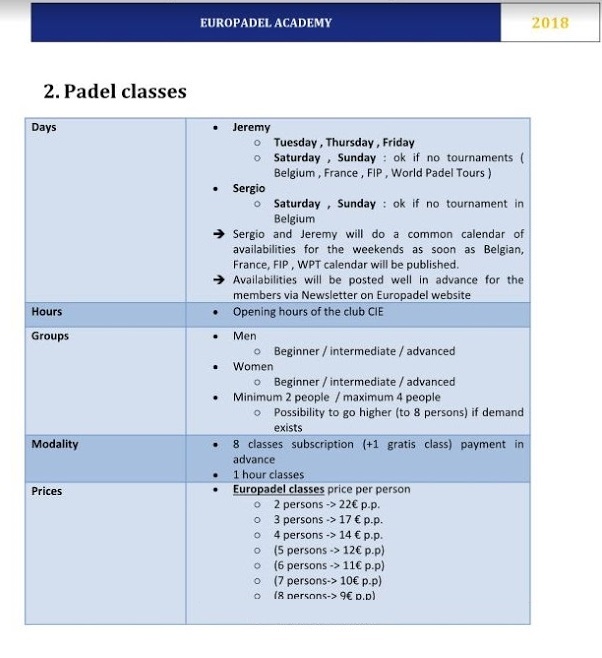 To organise clinics, bringing the possibility to all EuroPadel members for training with pro players. To organise different stages and social events. WHERE will you be trained? The academy will develop its main activities in the new facilities located in the CIE Club Overijse ( Dennenboslaan 54, 3090 Overijse). As a transitory measure, and taking into account the availability of the court, we could organise some lessons in Waterloo. WHEN will you be trained? The different courses will take place every Thursday, Friday, Saturday and Sunday (all days morning and afternoon) from 10 AM to 9 PM. As the academy is in a developing process, we will expand to other days and hours the courses offering. The training is addressed to all members of EuroPadel, youth public and less young members :), covering all different levels: from beginner to advanced player. We offer a full range of possibilities, from groups up to 4 to private lessons, at different prices. The Academy will offer you a lot of training (padel and physical) courses, activities, fun tournaments, etc. Our excellent teacher, Sergio, will be waiting for you. And in addition, we have recruited the best Belgium padel player, Jeremy Gala, who has been played some professional tournaments of the WPT (World Padel Tour) last year. You can register filling up the following google registration form. VERY IMPORTANT: Please note that in order to be able to enroll in different academy courses, you MUST be member of EuroPadel. If it is not the case and you are interested in doing so, you can become member of EuroPadel online.